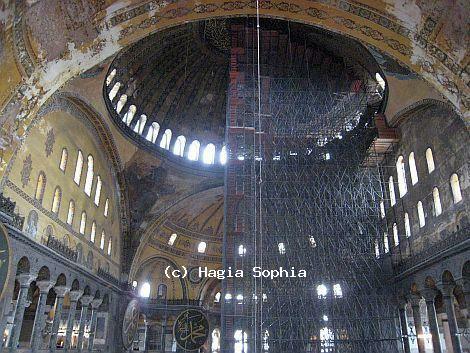 It is mostly the dome which makes Hagia Sophia world famous. Hagia Sophia dome sits at the centre of the church. It is between two half domes which together equals to the diameters of the dome. The dome is built by brick and mortar, it is 31, 24 mt (102 ft 6 in) diameters and is 55, 6 mt (182 ft 5 in) high. Because of the several repairs and constructions in time, the dome lost its circular shape and the diameter became 31,24 mt (102 ft 6 in) to 30,86 mt (101 ft 3in). Hagia Sophia Dome is carried on four pendentives and these pendentives enable its transition into the square shape of its piers below. These pendentives distribute the weight of the dome to the walls under it.